AFC - 12/01/15 This Is Pig Slaughter! "A wise man's shame is a fool's pride," as Croatians are wont to say. The proverb has become relevant as of late, what with various individuals posting photos from the traditional pig slaughter on social networks. The photos of slaughtered pigs with blood streaming down their necks are accompanied with comments such as "One down…" and similar attempts at humor. 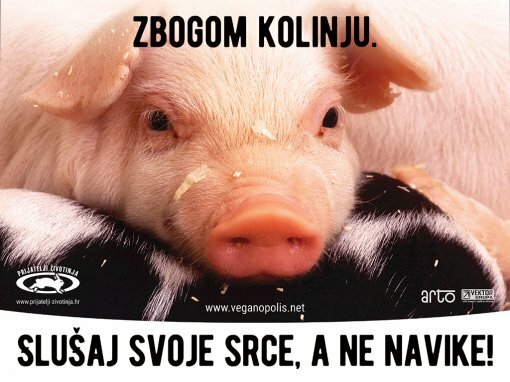 Croatian pig slaughterers are an example of the basest brutalization and mockery of intelligent, curious and sentient creatures, victims of human greed, habits and primitivism. According to the Ministry of Agriculture's Instruction on the Procedure for Slaughtering Pigs for Private Consumption, "animals must be spared unnecessary pain, discomfort or suffering during slaughter and the procedures related to slaughter" and can be killed "only if rendered unconscious." 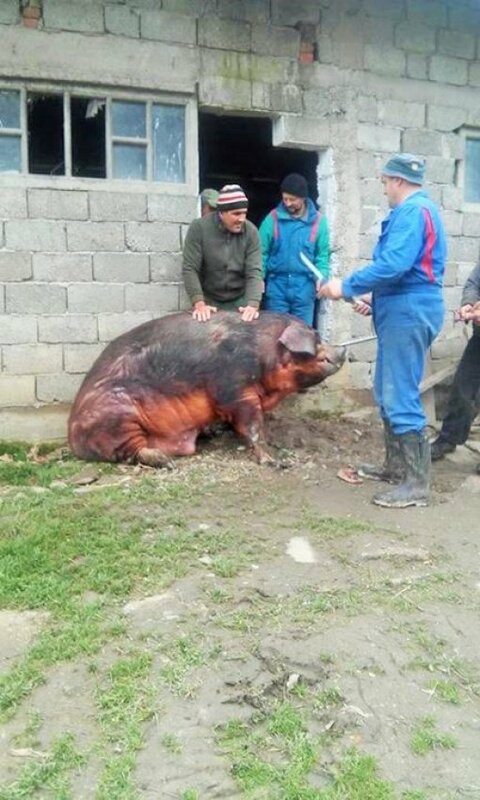 Patronus, an animal protection organization from Sisak, forwarded to Animal Friends Croatia photos from a Facebook account which clearly show that regulations are not being followed at pig slaughters and that slaughterers can't be bothered to spare a thought for animal welfare. 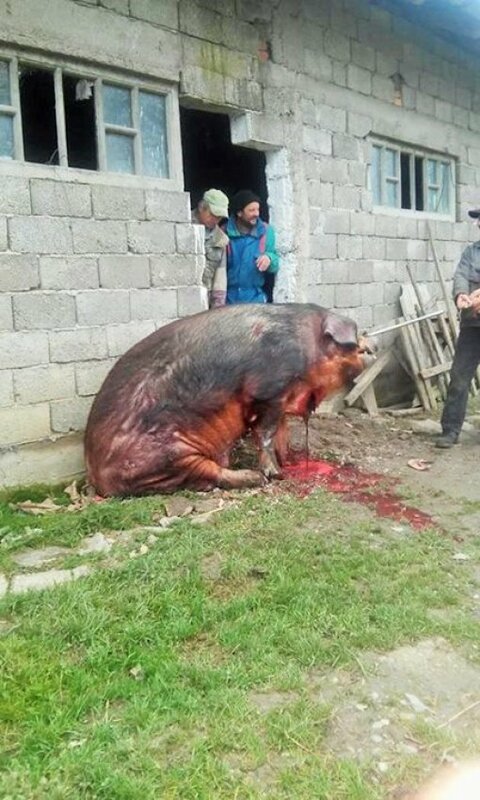 The photographs show a terrified pig dragged into the courtyard with a snout wire, after which its neck was cut with a knife. Blood streaming from its slashed carotid artery soaked the yard. In light of pig slaughterers' usual practice, the Ministry of Agriculture's instructions, including the directive that "only persons appropriately trained for similar jobs can practice slaughter to avoid causing unnecessary pain, discomfort and suffering to the animal," are pointless and ironic. The Ministry does not employ enough inspectors to supervise all pig slaughters in Croatia and ensure that animals are stunned and slaughterers take care to spare the pigs "unnecessary pain and suffering." As a society, we are reasonably sensitized and the abuse of dogs and cats gets our blood boiling. However, only vegans and vegetarians are sickened by animal slaughter, although such violent acts deserve general censure. From early childhood, we are taught that animal slaughter is a necessary evil on meat's way to our plates. We pretend we don't hear animals' screams, don't see the terror in their eyes, don't know about the terrifying realization of the animal awaiting slaughter that the one before died in agony and suffering. Some cling to the idea of "humane slaughter," as paradoxical as the term may be. The carnist system that we were raised in separates us in our minds not only from other living beings that we use to fulfil our alleged needs, but also from each other and the only thing that matters—our humanity. The brutality and primitivism of pig slaughter shouldn't be criticized only by animal protection organizations, but by every compassionate, conscientious and common-sense person. Slaughter is slaughter, be it of a human child, adult or some other animal. Pig slaughters are especially cruel because they present the spilling of blood and unnecessary death as happy gatherings, and not brutal taking of innocent lives that we should be ashamed of. There is no humane slaughter. As a morally progressive society, we should work toward a peaceful diet. 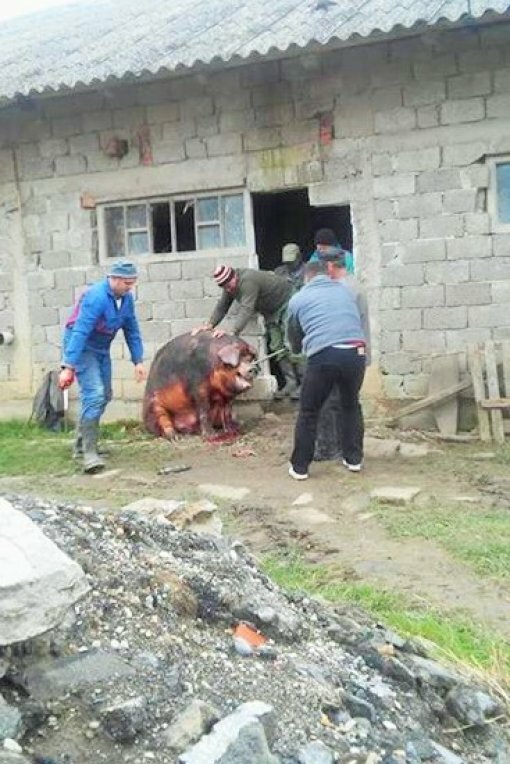 Animal Friends Croatia will press charges against the persons responsible for the pig slaughter in Sisak, who disregarded the Ministry's instructions. Most importantly, we appeal to everyone not to support animal cruelty and refrain from participating in needless violence with their dietary choices, which also harm their own health and contribute to environmental destruction. The short film "Pigs like dogs", the "Farewell to pig slaughter. Listen to your heart, not habits" billboard and more information can be found at www.prijatelji-zivotinja.hr.